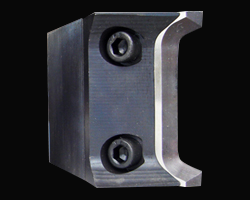 Key Knife’s newest product innovation, planer side head retrofit holders, allow planer mills to upgrade existing conventional planer side heads with disposable knife technology. Retrofit holders are a direct replacement for L and LV knives. The simplified design only requires the holders to be set up once. After the initial installation holders remain fixed to the side head for knife changes. 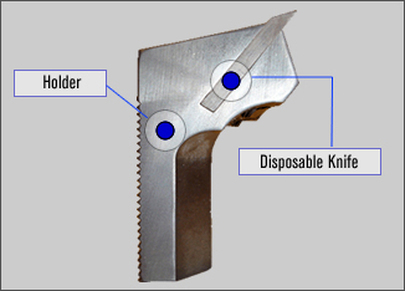 The small disposable knife eliminates the task of grinding and all associated costs. Upgrading is as simple as changing knives! Knife life 2 x longer than conventional knives (minimum). Eliminates grinding, and all associated costs. side head for knife changes. Reduces handling of knives and heads (safety). Manufactured from modified A8 tool steel for excellent wear resistance and durability. Knife available in standard dry and green target sizes. Available radius sizes: 1/8", 3/16", 1/4". Knife holder available in both L and LV configurations. 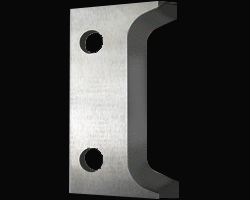 Manufactured from chipper steel for strength, durability, and wear resistance. Corrugations on back of holder fit into head corrugations for easy setup. Sold in weighted (matched) sets of two.